The fields around La Verriere are planted mainly with Lavandin, known for the purity of its scent. In July, the lavender crop is harvested and distilled; the essence then used year-round as home fragrance and soothing bath oil. 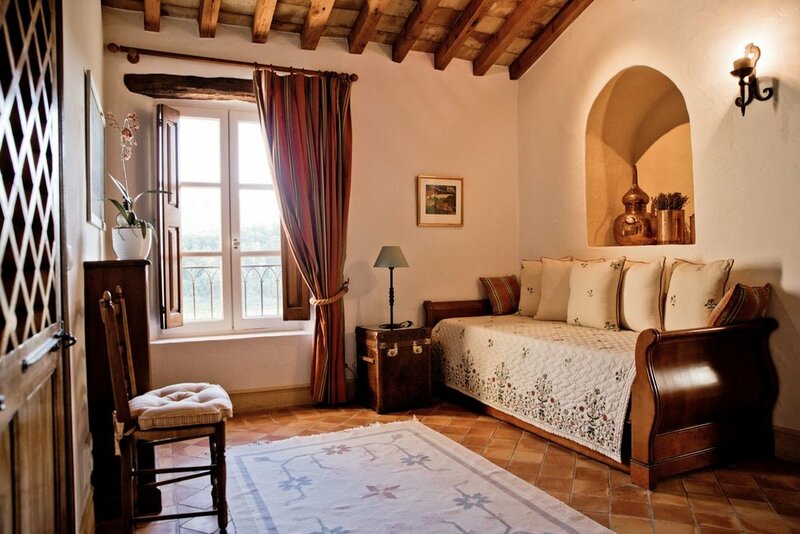 The bright, airy, south- facing “Lavender Suite” looks out onto the vineyards, the forest, and beyond to the Dentelles de Montmirail mountains. The picturesque view of the western courtyard during sunset is especially romantic; brides, grooms and couples celebrating anniversaries will therefore be particularly drawn to its spoils. Pay particular attention to the bed canopy and the crisp whites and blues that the room is dressed in! A cosy antechamber, complete with antique lavender distiller, sleeps an additional two persons and is suitable for families with children.